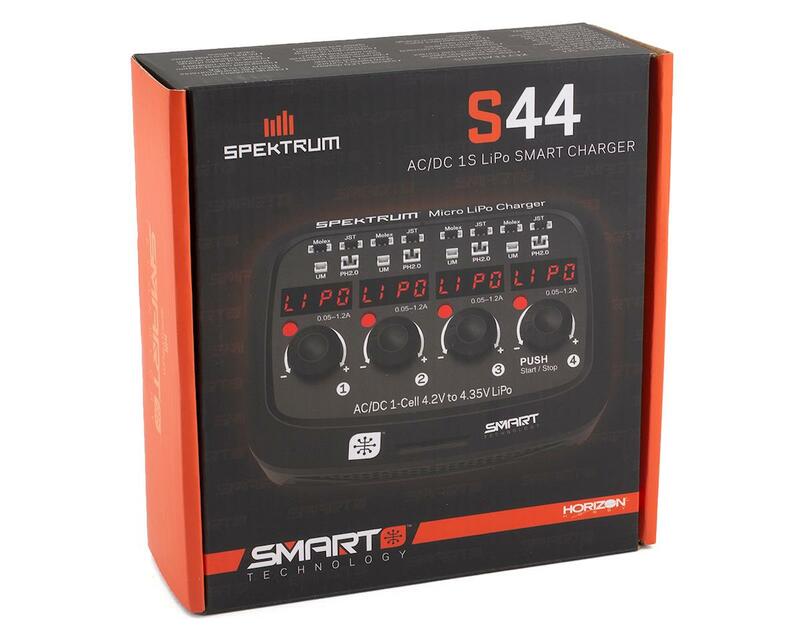 The Spektrum Micro 4 charger is a 4-port tool for the RC pilot who wants the ultimate in 1S LiPo battery charging. Featuring Spektrum Smart Charging technology, its digital LED status screen delivers vital battery information in a clear manner the instant you connect. Its compact all-in-one design incredibly offers four independent charging channels, each with enough built-in connectors so that charging multiple 1S batteries with the highest level of precision is easy. Each of the four charging channels is built-in with independent circuitry to enhance charge precision and efficiency. Vivid LED status lighting includes individual 4-digit displays and multi-color LEDs so you can instantly see the charge phase and battery condition. The simple press-dial interface allows you to finely tune the charge rates from 0.05 to 1.2A making it possible to fast-charge most high rated batteries. Exclusive software detects LiPo and LiHV 1S batteries automatically and combines with Spektrum Smart Charging technology so your batteries get maximum protection against short circuit, over current, reverse polarity and input voltage errors. 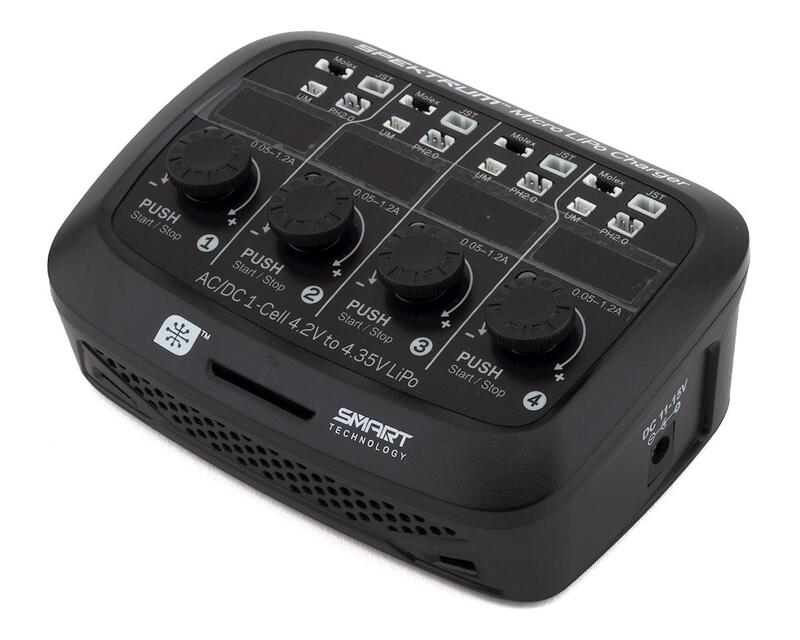 The Micro 4 AC/DC system works when connected to a standard wall outlet or you can even take the Micro 4 charger on the go. 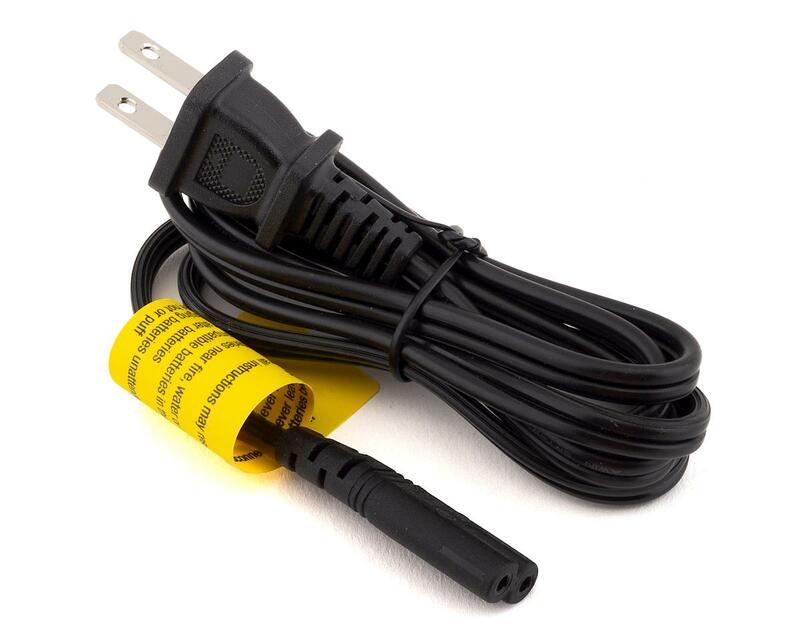 Because it will accept power input sources as low as 5V, any standard USB power source can be used such as a laptop or similar. Unlike charging multiple 1S batteries in parallel, each battery is individually recognized. As a result, you can charge individual 1S batteries with the precision of much more expensive charge units and possibly extend the life of all of your 1S batteries. Four individual charge circuits and four separate charge ports make it possible to charge multiple 1S packs with precision. Choose the exact charge rate you need from 0.05 to 1.2 amps using the individual dials that combine with a 4-digit display and a multi-color status LED system so you can keep a fleet of batteries working hard for you. Simply connect your 1S battery into one of the charge ports and the Micro 4 instantly displays battery voltage. 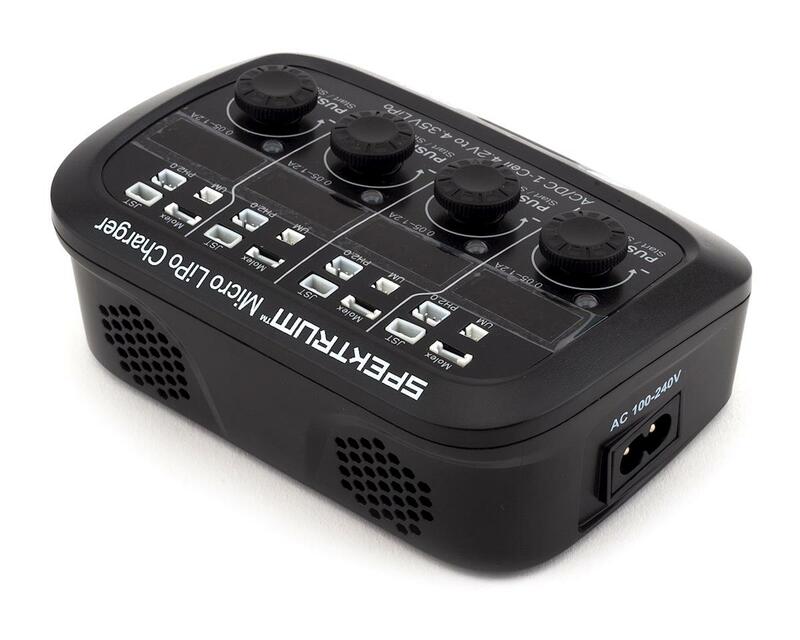 The Micro 4 conveniently powers from a standard 120V wall outlet or remote power source. Its pushbutton dial keeps programming all four charge ports simple while the LED displays clearly show charge status, rate, voltage and more. Each of the four ports features four connector types to select from so there are no cumbersome adapters to untangle. Lightweight and small in size makes it even easier to stash into a backpack and take anywhere.